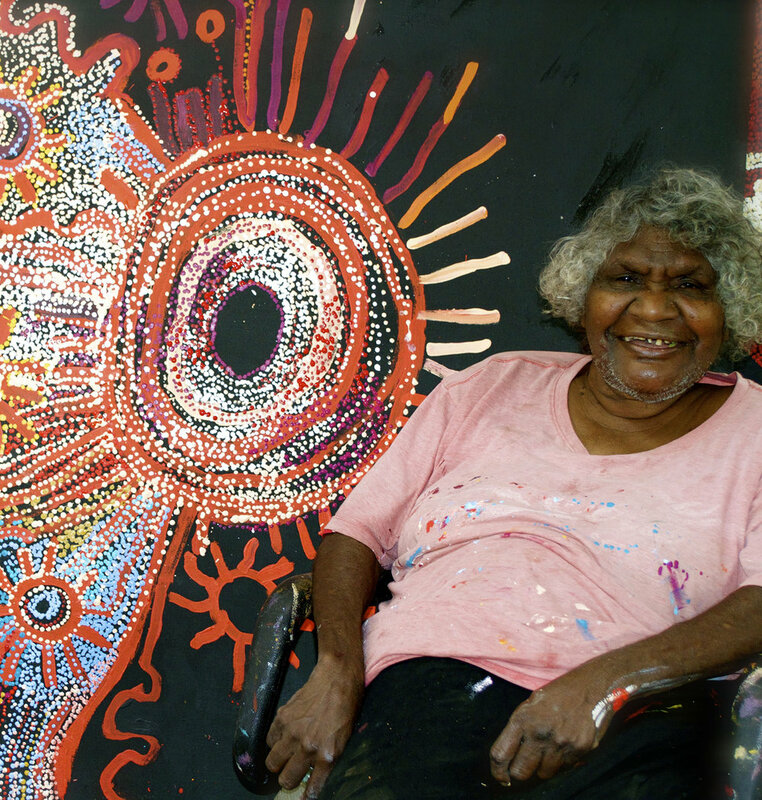 Manyitjanu Lennon often paints her mother’s country west of Kaltjiti and south of Watarru. As she describes the country: “This is Mamungari’nya. The place Mamungari’nya is a long way away. It is over the other side of the sand dunes past Tipilnga. The place where many white trees are growing, many white marble gums. The place where women came turned into the white marble gums on the sand dune south of Watarru; this is the Tjukurpa story. So this is Mamungari’nya where lots of little gum saplings and emu bush grow. This is a place of claypans.” This is a women’s site south west of Watarru. Manyitjanu recently returned to the arts centre to paint the stories from her country including Mamungari’nya and the Seven Sisters, as well as landscapes from Aralya and Kunytjanu. Her style is characterised by bold and energetic use of colour. Manyitjanu Lennon is a senior elder who holds extensive cultural knowledge. She lives at Watinuma in the APY Lands and works with the Kaltjiti Arts Centre. Originally she is from the north of Watarru. Like many people of her era she was born in the desert when her family were walking around. As a child her aunties took her from Watarru to Ernabella where she learned numerous arts and crafts such as making moccasins and cushions out of kangaroo skins, spinning and dying wool, batik tie-dying and punu (wood carving). She married and moved to Fregon when it was established in 1961. She was involved in the Fregon Choir, helped set up the Fregon Craft room as well as the Fregon School.